Lisa Carrie Goldberg is a Canadian-born multidisciplinary artist currently practicing in Perth while completing a Masters of Biological Arts with SymbioticA at The University of Western Australia. Her projects often take the form of full-sensory installations that mimic psychological and sociological experiments. Her work examines the realm of art and science, covering topics in neuroscience, anthropometry and microbiology. The presentation of her projects function as teaching tools, which exceed merely representational work. For Lisa, being an artist means having a social responsibility to her surroundings. One aspect of this process involves research and collaborations with non-artists. As a component of her thesis, she has recently completed a two-year investigation into the semantic and diagrammatic correlations between sleep science and art. 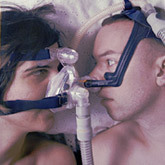 This process involved a series of experimental all-night performances held within a sleep laboratory. Her works have been shown in Canada, United States and Australia and she has recently completed a three-month residency at The Perth Institute of Contemporary Art. In 2008, Lisa earned a Bachelor of Fine Arts, with double distinctions, from Massachusetts College of Art and Design. She is completing a Masters of Science in Biological Arts at SymbioticA. Structuring Somnolence highlights how the use of graphical representations of sleep positioning can be changed for the sake of art and how scientific tools can be repurposed for artistic tools. With a specific concentration on sleep architecture and body positioning within a sleep study, the Conductor and an administering sleep technician will reconfigure the sleeping body of one volunteer participant with the intention of forming predetermined landscape/architecture drawings from the emerging graphical sleep data known as Sleep Architecture. The purpose of these studies is unlike a traditional scientific experiment in that this research is not attempting to solve a problem; there are no health benefits to an experiment of this sort. It is not about calculating sleep efficiency; in fact, the sleep of the subject will be disturbed for the sake of this research. Rather, it should be considered as a method for creating art, using the electrical data gathered from a sleep study for an objective assessment. It is a creative exercise both for the Conductor and for the subject involved, a volunteer who chose to participate in the study because they were intrigued by the idea of physically embodying the shape of their chosen structure in a somnolent state. As such, this project should be regarded as research with an artistic endeavour. The artifacts remaining from this performance research will serve as provocation. Structuring Somnolence aims at probing science’s inclination towards quantifying sleep. The project is intended to challenge the stigma of ‘ownership’ that surrounds the workings of the Laboratory, by permitting an artist to have discretion over experimentation, which some might view as a figurative contaminate within the sterile environment. This performance is imbedded with challenges; those being fighting against the natural rhythms of the subject’s body during sleep as well as the challenge to the artist to remain attentive and creative while experiencing the effects of sleep deprivation on themselves. Structuring Somnolence was featured in Visceral:The Living Art Experiment, SymbioticA's 10 year anniversary exhibition at Science Gallery, Dublin from January 28 - February 25 2011. 2010 The Perth Institute of Contemporary Art: "The Perth Institute of Sleep Behaviour"